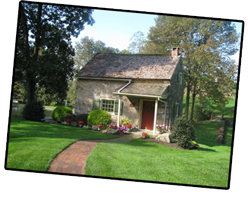 This historic circa 1750 Stone tenant workers' house was restored and opened as Walnut Valley Guest House in 1985. It is the oldest Guest House in the Churchtown community. Used during the Revolutionary War as a forge worker's shop and home, and then later as a spinning mill, the fully restored stone structure has become Walnut Valley Guest House. 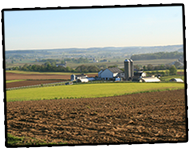 Its privacy and early American warmth will enhance your Lancaster County visit while affording ready access to Lancaster County's major sites and events. Get away to your own 18th century stone guest house nestled in the heart of Amish farmland and tradition. Relax in the quiet privacy of Walnut Valley's secluded 12 acres located just outside of Churchtown in Pennsylvania's beautiful, history-rich Lancaster County.